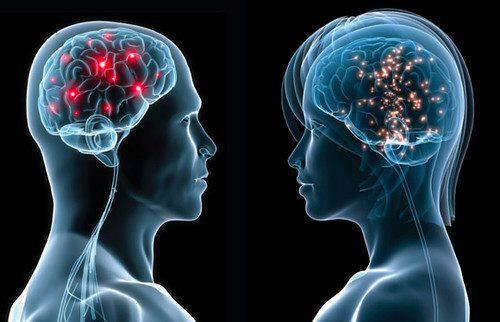 Womens brains designed to concentrate multiple task at a time. Women can Watch a TV and Talk over phone and cook. Mens brains designed to concentrate only one work at a time. Men can not watch TV and talk over the phone at the same time. they stop the TV while Talking. They can either watch TV or talk over the phone or cook. Women can easily learn many languages. But can not find solutions to problems. Men can not easily learn languages, they can easily solve problems. That's why in average a 3 years old girl has three times higher vocabulary than a 3 yeard old boy. Mens brains has a lot of space for handling the analytical process. They can analyze and find the solution for a process and design a map of a building easily. But If a complex map is viewed by women, they can not understand it. Women can not understand the details of a map easily, For them it is just a dump of lines on a paper. While driving a car, mans analytical spaces are used in his brain. He can drive a car fastly. If he sees an object at long distance, immediately his brain classifies the object (bus or van or car) direction and speed of the object and he drives accordingly. Where woman take a long time to recognize the object direction/ speed. Mans single process mind stops the audio in the car (if any), then concentrates only on driving. When men lie to women face to face, they get caught easily. Womans super natural brain observes facial expression 70%, body language 20% and words coming from the mouth 10%. Mens brain does not have this. Women easily lie to men face to face. So guys, do not lie face to face. If a man have a lot of problems, his brain clearly classifies the problems and puts them in individual rooms in the brain and then finds the solution one by one. You can see many guys looking at the sky for a long time. If a woman has a lot of problems, her brain can not classify the problems. she wants some one to hear that. After telling everything to a person she goes happily to bed. She does not worry about the problems being solved or not. If women are unhappy with their relations, they can not concentrate on their work. If men are unhappy with their work, they can not concentrate on the relations. Women use indirect language in speech. But Men use direct language. Above is just for info as may be correct or may be not but a good work till we got the best analysis.